Harishchandragad a hill fort in the Ahmednagar district of Maharashtra which is one of the most challenging treks in the Western Ghats situated in the Malshej region of the ghats. It is most famous places near mumbai for trekking and camping, thousands of the tourist attracts to visit and enjoys their Adventure vacations. 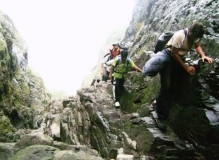 Adventure trekking near Mumbai package is design for trekking lovers who wishes for adventure tours along with holiday. Tour starts from Mumbai and cover Harishchandragad fort via Paachnai village with proper guideline. Harishchandragad fort can be reached from two directions: North and South. The base village from the Northern side of the fort is Paachnai and the base village from Southern side is Khireshwar. By Bus: It is about 201 kilometres away from Mumbai and it takes 4hours and 30 minutes to reach this place on a day with normal traffic. One has to board the bus or a private vehicle to the village of Pachanai. From here, the way is straight to the topmost point. Most of the trekkers visit throughout the year for trekking but maximum tourist attract for trekking in winter season when the climates get cool and pleasant. The Harishchandragad fort is quite ancient. Its origin is said to have been in 6th century, during the rule of Kalchuri dynasty. The various caves probably have been carved out in the 11th century. The various constructions on the fort and those existing the surrounding region point to the existence of diverse cultures here. Marathas Took over Fort from Mughals in 1747. However before you begin with the trek, make sure you have ample amount of water and other needed stuffs. Because the these villages are very small, expect not to find anything in village shops. There are two very big caves at the top. Harishchandragad fort trek is one of the most ideal trek for camping. Harishchandragad is the best fort in Maharashtra for camping. There are 2 Caves which can be used for camping. These 2 caves can accommodate attest 100 people. Sahyadri ranges have some of the best monsoons getaways that make for amazing trekking OR Holiday destinations near Mumbai and Pune. There are some famous places where you can find lots more sightseeing’s to visit and enjoy. If you are planning for Adventure Holidays through good and well prepared company, then you are in right place. Holiday Travel Pvt Ltd. Company is very well known and well planned company. They provide al;l the types of well designed holiday package to enjoy your dream holiday with perfect guideline and happiness. Its aim to provide 100% Satisfaction through their service and plan, we plan all type of holiday package as well as adventure package.